Here are some facts about Saint Patrick, the patron saint of Ireland, who is also known as the Apostle of Ireland. St Patrick was born in Britain in the time of the Romans. The exact place of his birth is unknown, although some historians have suggested it was Glannoventa (modern-day Ravenglass, Cumbria). His father was Calpornius, a deacon, and his grandfather was a priest called Potitus. He was captured when he was a teenager and taken as a slave to Ireland. As a captive, he worked as shepherd. He prayed everyday and his Christian faith grew. He escaped from his masters when he was in his twenties and he returned to his family. A few years after his return, Patrick started to have visions telling him to become the ‘Voice of Ireland’. Patrick returned to Ireland as a Christian missionary. He baptised thousands of individuals and ordained priests to run the new Christian communities which were being formed. Much of what we know about St Patrick comes from two of his letters, the Declaration and the Letter to the soldiers of Coroticus. Most historians agree that these documents are authentic. The date of St Patrick’s death is not certain. Some believe that he passed away in 493, others think it was 17th March 460. It is claimed (but not proven) that St Patrick is buried at Down Cathedral in Downpatrick, County Down. The shamrock, a three-leafed clover, is one of the key symbols of St Patrick’s Day. According to legend, St Patrick used the plant to symbolise the Holy Trinity and teach the Christian concept of three distinct persons (the Father, the Son (Jesus Christ) and the Holy Spirit) in one God. The shamrock was also an important symbol in Ireland before the introduction of Christianity. 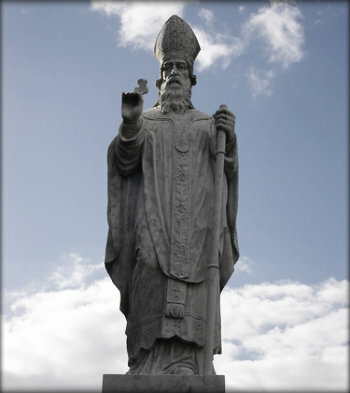 St Patrick is also credited with banishing snakes from Ireland, by forcing them into sea after they had attacked him as he was fasting on a hill. Whether Ireland was ever the home to any species of snake is up for debate. Some people believe that the story might be a metaphor for St Patrick’s mission in Ireland, to spread Christianity and drive out the druids (the snakes) and their pagan rituals. St Patrick’s Day is celebrated each year on 17th March (which is believed to be the day of his death). St Patrick’s Day is now both a religious and cultural holiday. As the years have gone on, St Patrick’s day has developed from a religious holiday and feast day, to a more general celebration of Ireland and Irishness.